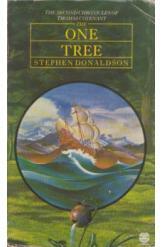 The One Tree by Stephen Donaldson, Sci Fi. Book is in good condition, all pages intact. Fleeing from the Land, Thomas Covenant and Linden Avery search for the One Tree in hopes of using its life-giving power to remake the Staff of Law. Lord Foul has no plans to make this easy for them, and from his new Sunbane-ravaged domain he dispatches an army of Ravers. Part of the Thomas Covenant the Unbeliever series.